St Etienne defender Franck Tabanou has completed his transfer to Swansea City. Tabanou joins the Premier League club on a three-year deal for an undisclosed fee, although St Etienne are thought to have increased their asking price to more than £3m for the 26-year-old. The ex-France Under-21 cap can play on the wing but is primarily a left-back. He will provide competition to Wales international Neil Taylor, who recently signed a new four-year deal with the Swans. 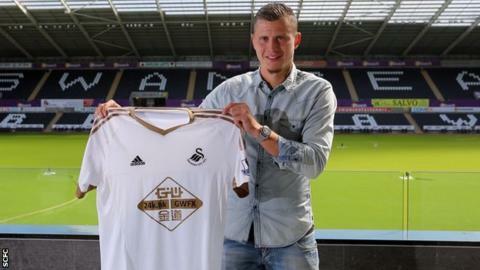 Tabanou is the second player to join Swansea from a French club within a week, after Ghana forward Andre Ayew arrived on a free transfer from Marseille. Swansea began talks in January but failed to land Tabanou in that transfer window. He made 37 appearances this season as Les Verts ended the campaign in fifth, earning them Europa League qualification. Tabanou will join up at Liberty Stadium with another former St Etienne player, Bafetimbi Gomis. Gomis has established himself as Swansea's first-choice striker since Wilfried Bony was sold to Manchester City for £28m.